I was surprized to find online a group of unpublished photographs by Margaret Bourke-White of African American residents in Greenville, SC, which is my hometown. 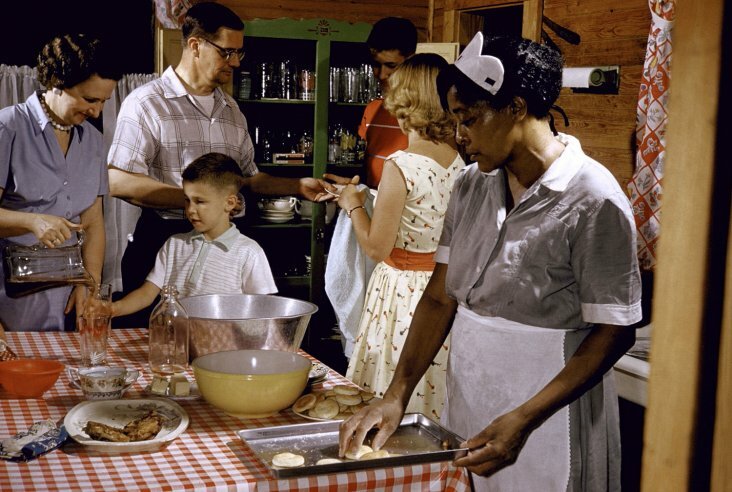 An African-American maid prepares a white family’s supper in Greenville, SC, 1956. One of the things that strikes me about the photograph is that the white family’s kitchen is quite modest. I remember just about everyone of any economic class in Greenville had a maid. The salaries of the black housekeepers were sinfully low . I read your article “Maids in Greenvile, SC” with great interest. I too grew up in Greenville, SC in the 1950’s and 1960s during racial segregation. Both my sister and I were cared for by a loving black woman who cooked and kept house for my parents and grandparents. She also worked for other families in Greenville. Maline and her husband Odell raised 4 children and purchased a home in the black community off of Laurens Road in Greenville. Although Maline was loved by our family, the “rules” of southern segregation were always a factor in her relationship with our family. She attended my sister’s wedding in 1959 but was escorted to the very back church pew for the wedding ceremony. She and her daughter Eileen attended my wedding. My grandparents owned several acres of land between East North St. and what was Pleasantburg Drive. In the early 50s the surrounding area was mostly fields and woods. I remember Eileen and I playing together in the summer. During lunch Eileen and her mother ate at different time from my parents and me. As a small child I never understood why they could not eat at the table with us. Shortly before I left for college Maline retired from service to our family. It was a very sad day for me. In 1980 my wife and I had our first child – Katherine Elizabeth. Maline’s daughter brought her to our home to see our new daughter. During that visit Maline offered to provide child care in our home for Elizabeth. Her offer was not made in the interest of making money but out of love for and loyalty to our family. She cared for both of our daughters (Elizabeth and Emily) until they entered elementary school. In 1997 (after I moved away from Greenville) our family visited Maline – by that time she was well into her 80s. We made pictures of her with my sister, Elizabeth, Emily, and me. The photos we made that day are one of my most prized possessions. That was the last time I saw her and somehow I knew that was our last chance to talk and that I could express to her how much I loved her. I am so glad I got to see her that one last time. Maline and I held hands for the entire visit. Maline passed away a few years ago. While I could not attend her funeral as I now live in St. Paul, Minnesota, my sister did attend as she lives in Greenville. I am currently composing a history of our family (Wood/Templeton/Tice/Smith) and have dedicated a chapter to Maline as she will always be a part of our family and I want to be sure that futuure generations of our family understand her loyalty and love to our family despite the unfair segregation in the South. Her life has been an example to me of how love can override adversity and hardship. Thank you so much for your comments about Maline. These relationships are so complex. People who haven’t experienced this kind of connection simply can’t believe that the inequalities between blacks and whites during that time of segregation would allow for such a love. I’m sure there are cultural/psychological conditions that forge this kind of love, and I hope to explore how these relationships come to exist. Thank you. I enjoyed reading your article since Greenville is also my hometown and I’m currently researching my own family history, mostly which are families that grew up in Greenville, SC and are still there today. As of to date however, none of the families I’m researching ever had any maids, white or black. So I beg to differ with you on the “everyone of any economic class had a maid in Greenville” quote. Some of my ancestors were simply too poor to afford help, and since the families were so large everyone could help out with the day-to-day duties. I did however know of one family that could have afforded help, but chose not to because once again, there were 10 children in the family that could do the work. That family happens to be my grandparents. My mother has told me on numerous occasions about the time a maid approached my grandmother looking for work. When my grandmother told her she didn’t need any help, the woman turned to walk away but then hesitated. Turning back around, the maid responded “Just you wait and see, one day you folks are going to be working for us”. You are currently reading Maids in Greenville, SC at JUST LIKE FAMILY.